In our in-house leadership learning networks, the interactions of those in the collaborative learning community can lead to organisation-wide change. One-off experiments and policies that were hidden become company standards (such as how Lissy changed IHG…). But in order to get to that point, the organisation has to establish an overall collaborative learning culture. … which leads to more individuals approaching work challenges as potential learning experiences, which leads to more sharing, more refining… And so on. Emergent Learning is the most natural way that we learn as humans… Which means it’s mindboggling that modern Leadership Development has not caught onto that framework yet. Stephen Hart, in charge of leadership development for Health Education England, has operated at senior level in both the military and the health service. I asked him about his experiences in each organisation and what shared learning there might be. A new article by Phil Dourado on patient-led care, a well-discussed but rarely practised tenet of Healthcare Leadership. What should patient-led care look like in real, practical terms? Mike Hoban, Morrison’s Marketing Director, has just recommended my Seven Secrets of Inspired Leaders book, along with The First 90 Days. Mike says there are too many books out there and that these are the two books marketers should be reading. that underlies our online communities. In these short videos, leadership development expert Phil Dourado explains how to build a leadership community of practice. We recently featured a guest post on the Leadership Hub from a leader we have admired for quite a while. Dame Stephanie Shirley came to us offering an article for the site and introducing herself, but our team already knew of her since my colleague Zara had pointed us at her TED Talk. We really admire her drive for furthering diversity. …brought to our attention by this article in Cardiovascular Business. In this connected world, much of our thinking happens collaboratively and ‘out loud’: it becomes formed during conversations, in real time. Yet when we get to work, we revert to what we feel are more formal, and therefore acceptable, ways of communicating and working together. For the most part, that means we revert to email. Our Leadership Hub is partly about bringing connected behaviour into the workplace, and helping evolve work from the assumption that this kind of social connection is informal and therefore somehow invalid or the equivalent of unstructured play. I have been a bit worried, I have to admit. I mean, 10 years after setting up the world’s first online global community of practice for leaders, and eight years of running one inside a FTSE 100 company, winning awards and all that good stuff, a big bit of me was thinking … If this is indeed the future of leadership development, why are we the only ones doing it? 1) Online leadership communities: where are we at? I’m writing a series of three articles for HR Director on the state of play in using in-house online leadership communities to develop leaders in a ‘community of practice’, as an alternative to, or to supplement, existing leadership development. The articles are based on eight years of running such a community of practice for one of the largest companies in the world. Article One: Open Source Leadership – The Future of Leadership Development? One of the joys of running an in-house leadership community is you get to spot wonderful leaders who may not be known as such to the outside world… Let me introduce you to one. Although I always say I refuse to believe in the notion of expertise, particularly that I have any, I just did an interview over on John Mattone’s site as part of their ‘Expert Interviews‘ series. As I’m supposed to be an expert in leadership development, the interview is about what I think is wrong with leadership development today and what large organizations should be doing instead. Click here to read my radical rant on John’s site. We will be attending Europe’s biggest showcase on technologies that support learning at work (from 3rd-4th of February) to display our proven online leadership development community for large organisations. I will be giving a Learning and Development seminar based on eight years in one of the world’s largest companies, bringing together 1,500 globally dispersed leaders to learn and share their best leadership practises. We’ve revamped the Leadership Hub open learning platform to be less about conversations and community posts and instead to focus on a series of ‘bitesize’ learning modules. All free. The Leadership Hub was the world’s first global online leadership community of practice when we created it in 2007. Things have to evolve, so we’re trialling these new learning ‘bites’ as they fit in with the overall proposition in The 60 Second Leader – that people don’t have time for long drawn out training any more, and need regular, short, sharp blasts of learning in few minute ‘chunks’. Yep, it’s the attention-based learning model that leadership neuroscientists Geoffrey Schwarz & David Rock wrote about as being more appropriate for time-poor busy people now. Here’s my blog post on it, and here’s the new Hub. Gosh. Views for the Little Book of Leadership and the Second Little Book of Leadership on Slideshare just passed 1.5 million. I know you shouldn’t Google yourself, ever. But, I just learnt from doing so that I’m number two on the UN’s recommended reading list for its in-house leadership development. 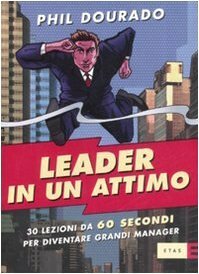 The 60 Second Leader book, that is. And when I say “Number 2”, I just mean it appears second on their list. Still, nice to know the UN thinks the book is important for developing the leadership competencies of its employees. I mean, they’re peacekeepers, diplomats and the like. Serious stuff. Well, that gives me a warm, useful, smug feeling. Well, I wish I did look like this. …or even feel as full of energy as this! My colleague spotted it this morning and it made us all laugh. Phil Dourado (Jumps tall buildings with a single bound…I wish). You moved me up three places in the ‘global guru’ rankings. Thanks. Ooh, thanks for the vote, if you voted. So, last year, I came 17th in this poll of ‘World’s Top 30 Leadership Gurus’. This year I’ve moved up three places to 14th. Of the 30 in the list, there are 17 I would genuinely tip my hat to. The other 13 I’m not so sure. And I’d include myself in that other 13; my own ‘Global Top 30’ would be different and wouldn’t have me in it. But, there you go. Polls are strange. I did ask the organisers why I was in their list in the first place and they said “The originality of your leadership development work” which I think refers to using an online leadership development community to get people to learn from each other about how to lead. We’ve won awards for running a global community like that for 1,500 leaders at IHG, the hotels company, over the past four years, and that has got a lot of attention, so I’m assuming that’s the ‘innovative’ work that led to being in this list. Renee Stevens, VP, Global Talent Development, and her team from IHG in the US are pictured picking up an American Society for Training and Development (ASTD) crystal plaque annual Learning in Practice Award for the IHG Leaders Lounge. The Leaders Lounge is IHG’s online community of leadership practice. It accelerates the global hotel company’s leadership development by sharing learning fast across the globe. The Leaders Lounge was developed, built and is run by Phil Dourado Business Communications Ltd. For a Research Paper explaining how this kind of leadership community works, including the Attention-Based Learning Model on which it is based, click here. 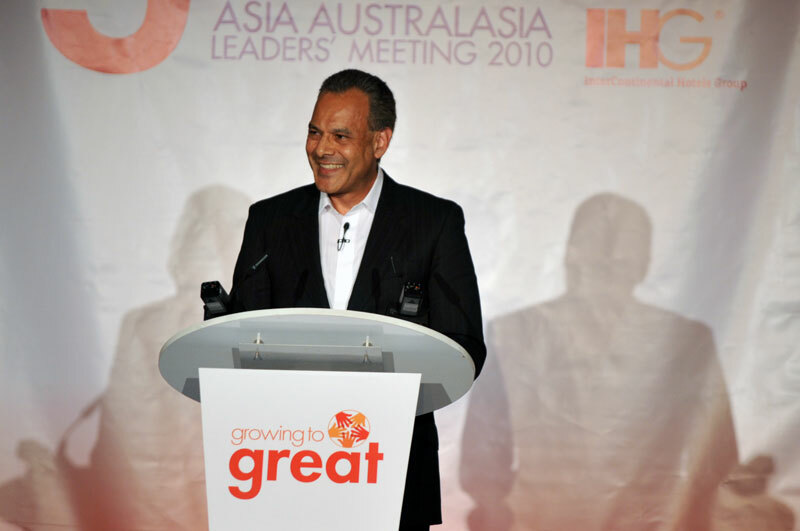 The IHG Leaders Lounge – an online global leadership community, built and run for InterContinental Hotels Group by Phil Dourado Business Communications Ltd – has won a 2010 Best Practice Award from Training Magazine. The Award will be made at the 2011 Training Conference and Expo in San Diego, in February. “I wanted to thank you for joining our first AA Leaders’ Meeting and agreeing to be our guest speaker. I’ve heard some fantastic feedback on your lunch session. 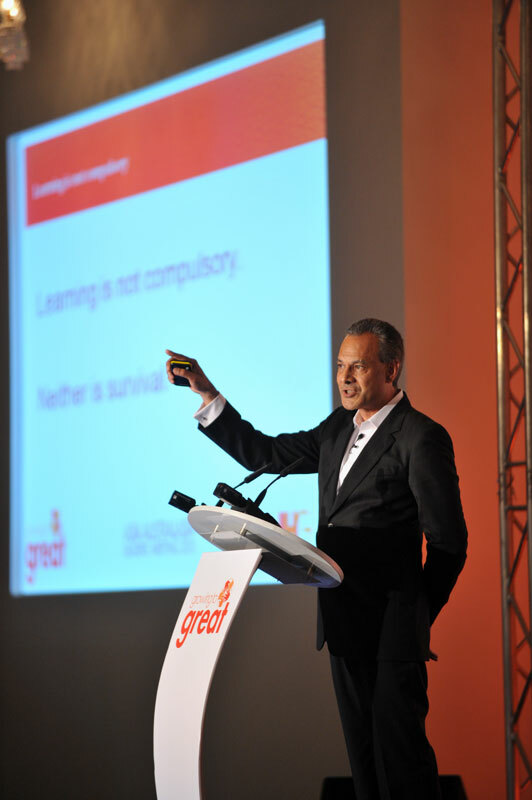 Part of the Growing to Great key message was about growth and development, and your session on Learning Agility will play a big part in helping our leaders going forward.” – Jan Smits, MD, Asia Australasia, IHG. Last week, the IHG Leaders Lounge – built and run for the world’s largest hotel company by Phil Dourado Business Communications Ltd – won its third award. At the American Society for Training & Development’s Workplace Learning & Performance award ceremony, held in Chicago on Monday evening, IHG received a citation for excellence in practice for The Leaders Lounge. The pic is of IHG folk receiving the award, including Randy Lummus in the middle and Cheryl Ross to his right. We get two plaques, one for IHG and the one on the right, held by Renee Stevens, IHG’s VP, Global Talent Development, is for our office wall here at PDBC Ltd. Last year the Leaders Lounge helped IHG win a BEST award from the ASTD. The Leaders Lounge also recently won the UK’s Chartered Institute of Personnel Development (CIPD) annual award for Excellence Through Technology (see below). The award was for the IHG Leaders Lounge, an online leadership development community built and run for the world’s largest hotel group by Phil Dourado Business Communications Ltd. IHG also won in 2009 an American Society for Training and Development (ASTD) BEST Award, ranking them as one of the best companies in the world at people development. The IHG Leaders Lounge formed 50% of the submission that won this award, the other half being Holiday Inn Stay Real training. The Little Book of Leadership is now available as a free Powerpoint download. Click the image to download it from Slideshare and, if you like it, pass it on as a gift to anyone else you think may like it, too. The Leadership Hub, the world’s first collaborative leadership development platform, is now available as a closed, in-house corporate leadership development platform. The in-house version of The Leadership Hub is designed in particular for large organizations that have a globally dispersed leadership group whom the organization wants to bring together virtually to build a leadership culture. The Leadership Hub for Corporates lets you disseminate best practice leadership from ‘hotspots’ of good practice out to the rest of the leadership community. The Leadership Hub, the world’s first online collaborative leadership development community, is now live. Think MySpace or Facebook for Leaders and you’re in the right kind of territory – a leadership collaboration and development site that uses social networking principles and tools. To join The Leadership Hub click here. The Hub is a Community of Practice, where leaders share their best practice, experiences and insights and learn from each other, so you need to be willing to contribute. If you have read The 60 Second Leader book, this is the online leadership community mentioned in that book that you are now eligible to join. As far as we know, it’s the first online community for leadership that is based on Web 2.0 tools (with members writing their own leadership diaries, blogs, messaging each other, emailing within the platform, uploading your own video clips, documents and other useful tools to share with the rest of the community) so that leadership experts and practitioners from all over the world can collaborate with each other. I’ve written a paper on Open Source Leadership which explains how this kind of collaborative leadership development works and how an in-house version can be built for large organizations who want one sitting on their intranet to grow and develop their leadership community. You can download it from the link at the top of this page. The 60 Second Leader, which was published in the spring in the UK and in the summer in the US, has just been licensed for translation into Turkish. Last month it was licensed for translation into Italian, the month before into Chinese and Polish, and back in May the publisher approved a request to translate the book into Vietnamese. There are some free extracts from the book for you on the link at the top of the page, drawn from a three-page article on the book that is in the current issue of The Marketer, the UK Chartered Institute of Marketing’s (CIM) journal. The book is a distillation of what great leaders do, broken down into 60 second reads, for busy leaders, would-be leaders and should-be leaders who don’t have time to read books. The book is available on Amazon and in all good book stores. We feel this book is of use to anyone who has had to adapt to and absorb a life-change that people outside see as impossible to cope with – showing that you can learn to not just cope with but rise above an ongoing ‘catastrophe’ like a terminal hereditary illness (or alcoholism or anorexia or other ongoing family traumas – we think our experience is applicable to families in other situations, too).